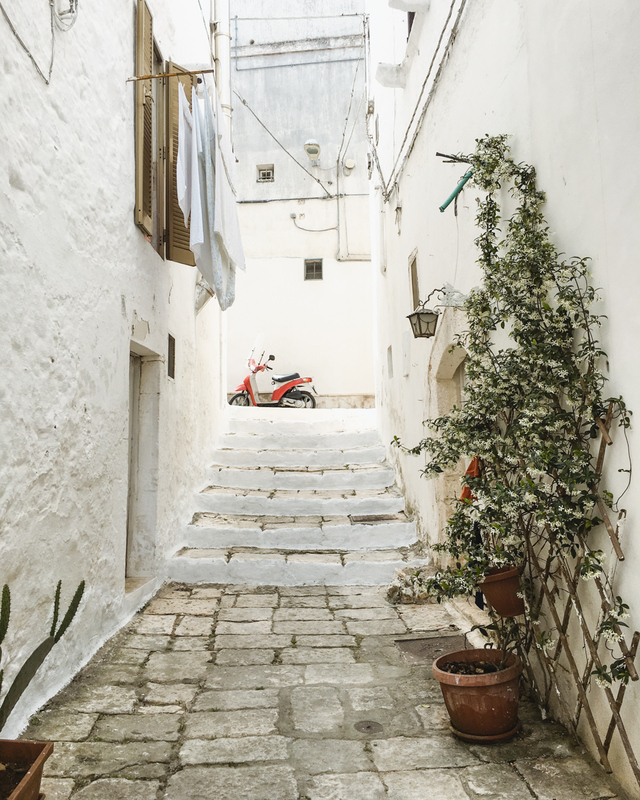 As soon as we moved to Italy, I wanted to explore the white alleys of Ostuni, the Trulli houses of Alberbello and the sandy beaches of Puglia. After a year and half, we finally took a weekend trip to experience all three. 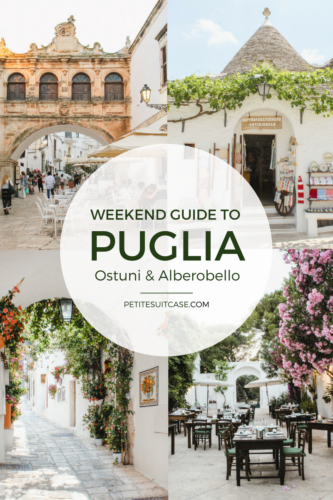 There is so much more to Puglia than Ostuni and Alberobello, but there are only so many days in a weekend. 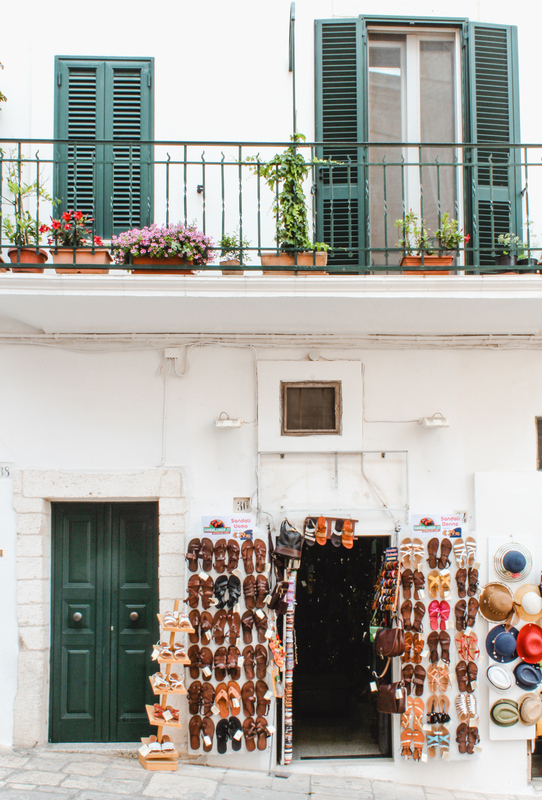 In this short guide to two cities in Puglia, I’ll share where to go for gelato and an aperitivo, where to stay in Ostuni, and the place where I had one of my all time favorite meals in Italy (it was that good). 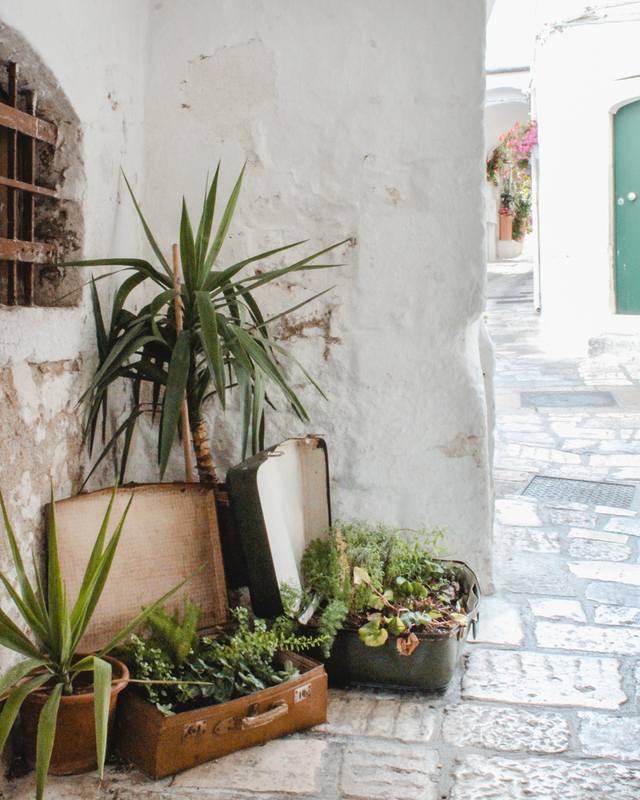 On a Friday we left the Naples area and arrived to our Airbnb in Ostuni after a few hours. 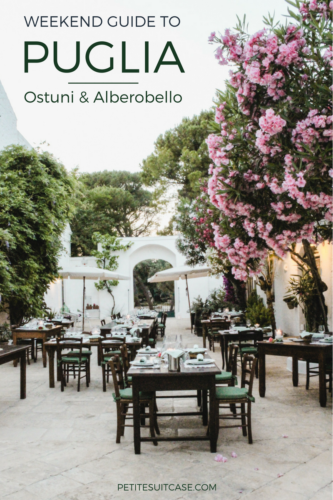 We opted to stay in Ostuni to be walking distance to bars and restaurants for a few nights. 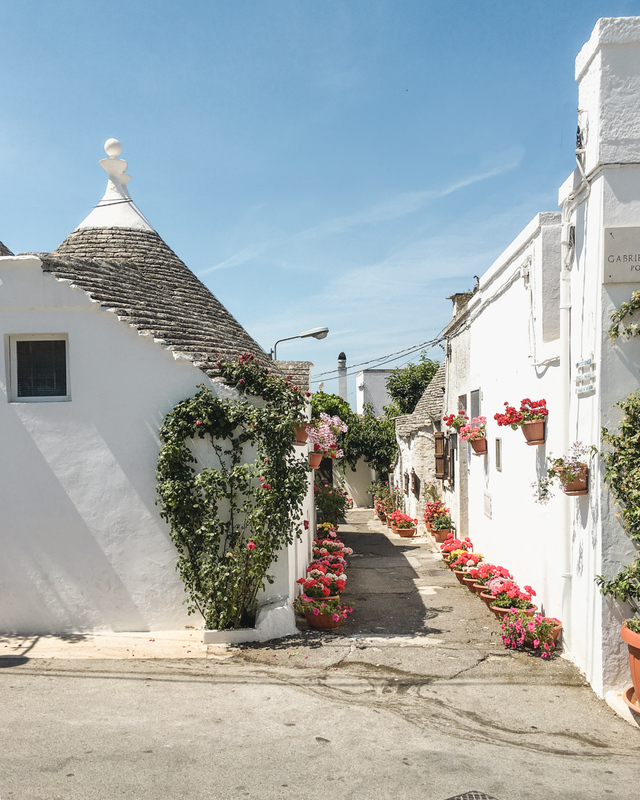 Staying in a trullo or at a masseria is also an amazing experience in Puglia. 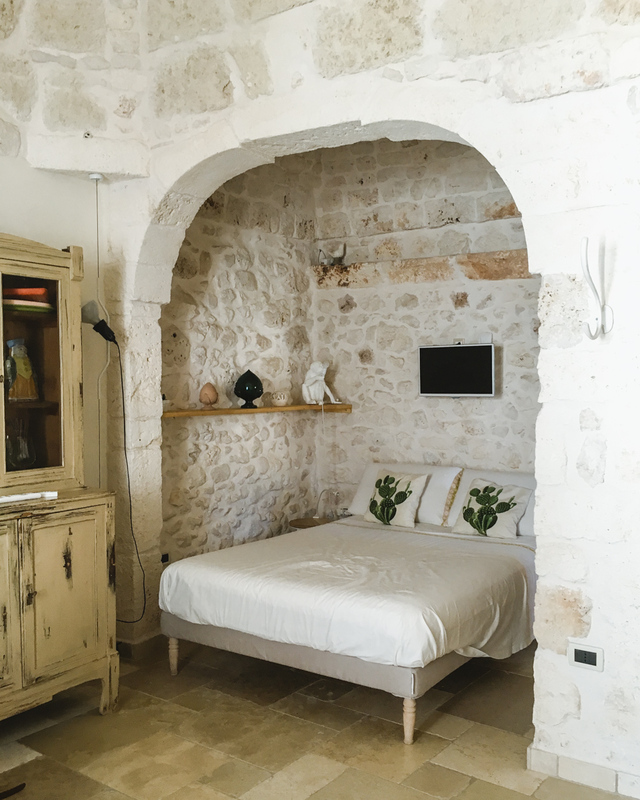 Check out Masseria San Francesco or Borgo Egnazia for a luxury masseria stay. 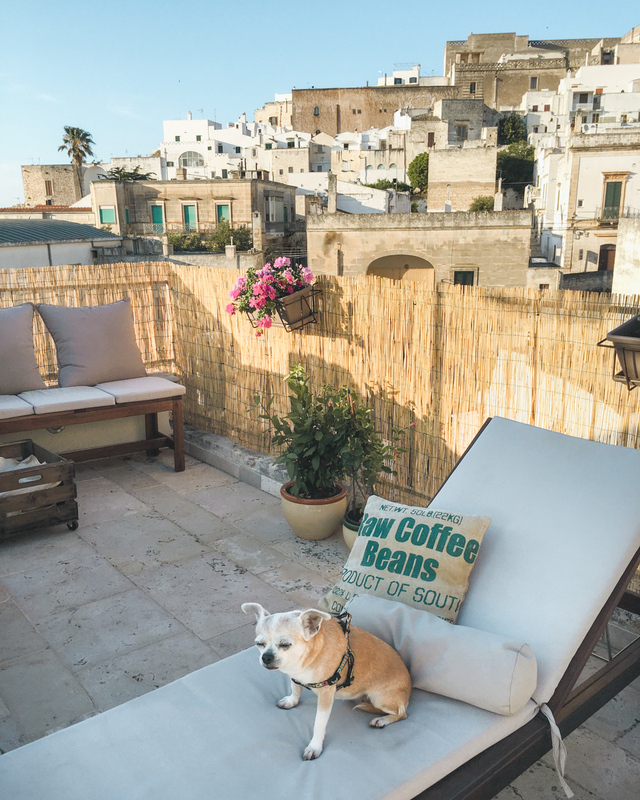 Alfie took full advantage of the rooftop terrace while I spent the afternoon exploring the white city, wandering in ceramic shops and buying local olive oil. 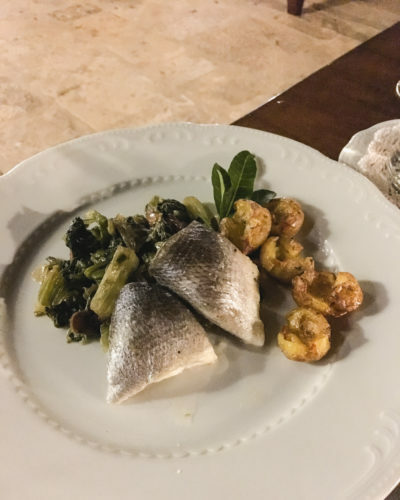 For our first night in Ostuni, I booked dinner at Masseria Il Frantoio without hesitation. We just went for dinner, but you can also book for the night. From the tour of the grounds to the 8-course dinner with wine pairings, the whole experience was detailed and personalized. Don’t expect a menu. They only prepare what is in season and growing in their garden. Most of the local dishes are vegetarian and they are happy accommodate any allergies. I have celiac disease and it was not a problem for them to create gluten free dishes. These iPhone photos really don’t do the meal justice, so you’ll have to trust me that this restaurant is truly amazing. 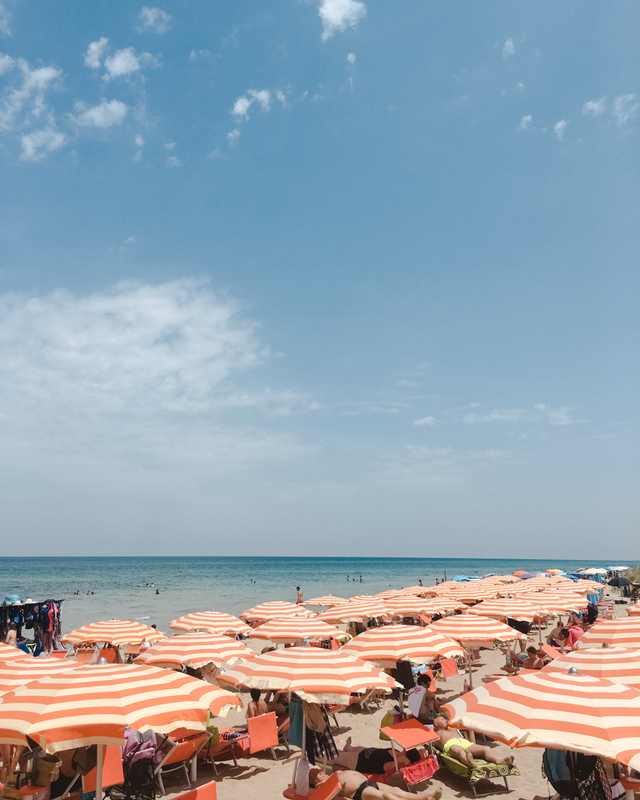 We spent the next day at a lido on the beach not far from Ostuni. This sandy beach was filled with lido after lido. Lido Verde and Lido Bizarro were popular choices among the locals. For a luxury experience, check out Coccaro Beach Club a little north. 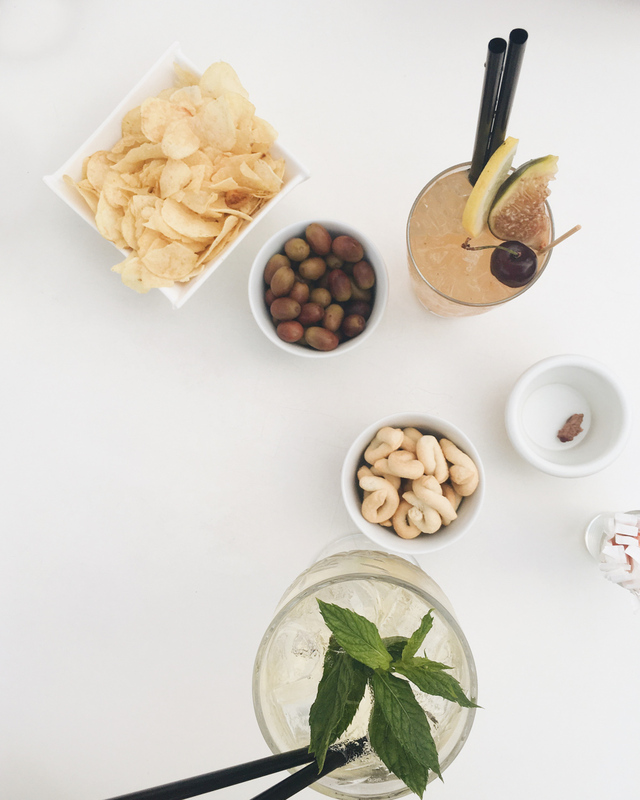 Pausa Café is the perfect spot for an aperitivo in one of the main piazzas. Try gelato or granita at Cremeria La Scala across the same piazza. Also, Gelateria Borgo Antico under the Arco Scoppa is a crowded spot. Get the mandorla flavor if you like marzipan. 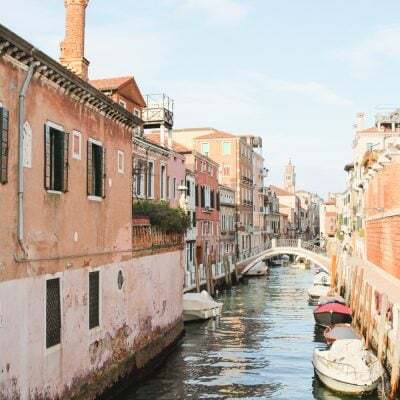 Al Solito Posto was highly recommended by our Airbnb host, but we couldn’t get a reservation. Luckily we found Borgo Antico Bistrot for dinner on their inviting outdoor patio. Be sure to get anything with burrata (that’s really the case for all of Puglia!). This was a great spot for relaxing outside and taking in the view. 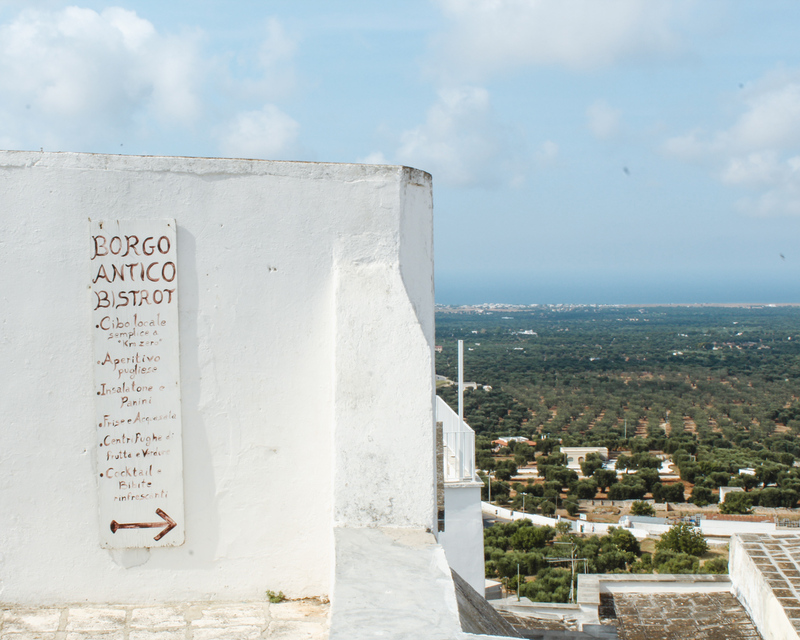 On our last morning, we grabbed a cappuccino at White Ostuni Tito Schipa before hitting the road to Alberbello. There’s a nice patio in the back which doubles as a great aperitivo spot too. 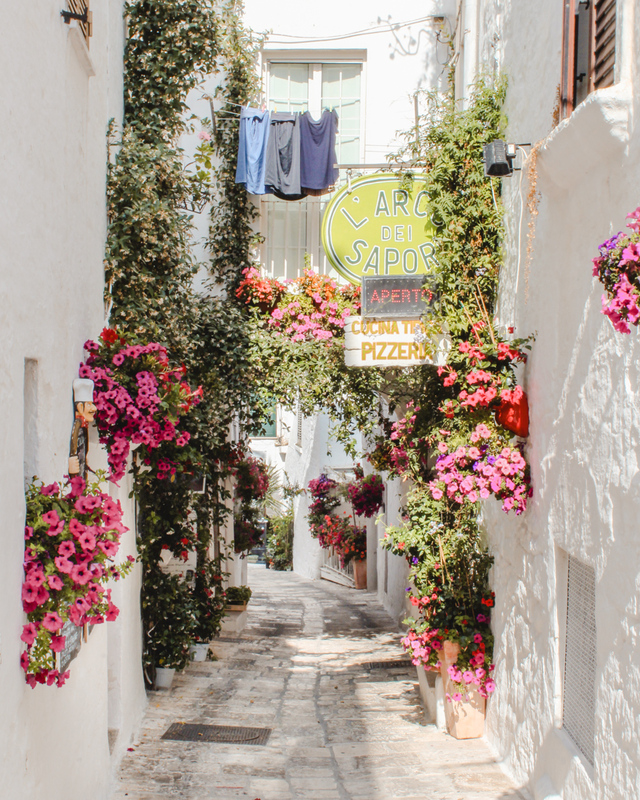 Alberobello is about 45 minutes from Ostuni so it made for the perfect stop on the way home. 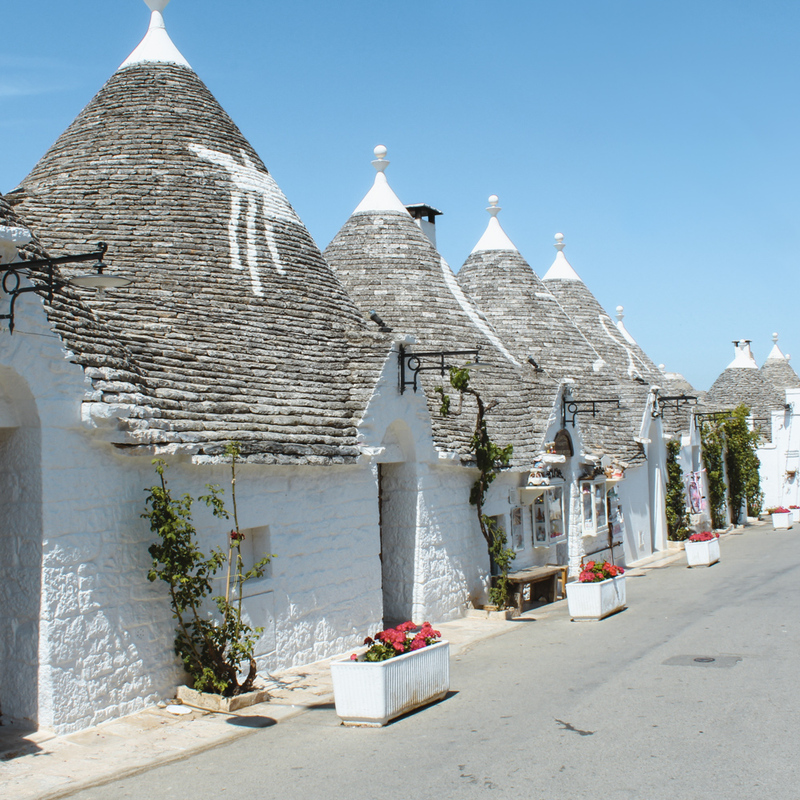 You’ll spot trulli houses all around this region, but Alberobello is famous for them. 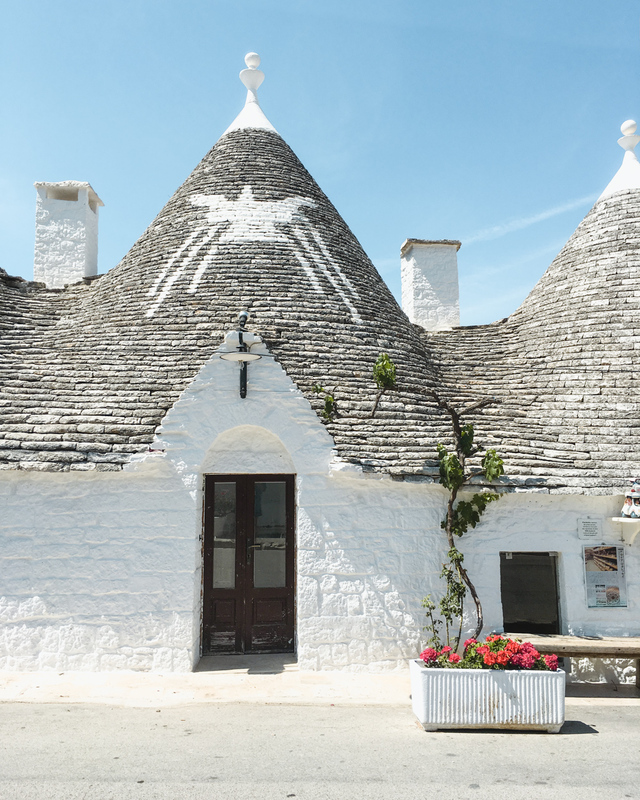 Trulli houses were built in this pyramid style without cement because they could be easily dissembled. Therefore, residents could avoid paying taxes on their homes. 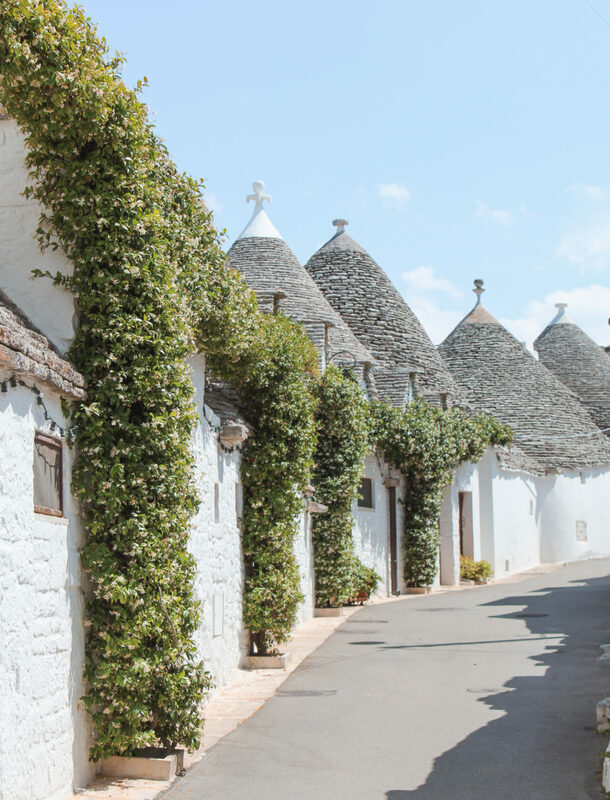 Honestly, you really don’t need more than a few hours to explore the trulli houses in Alberobello. 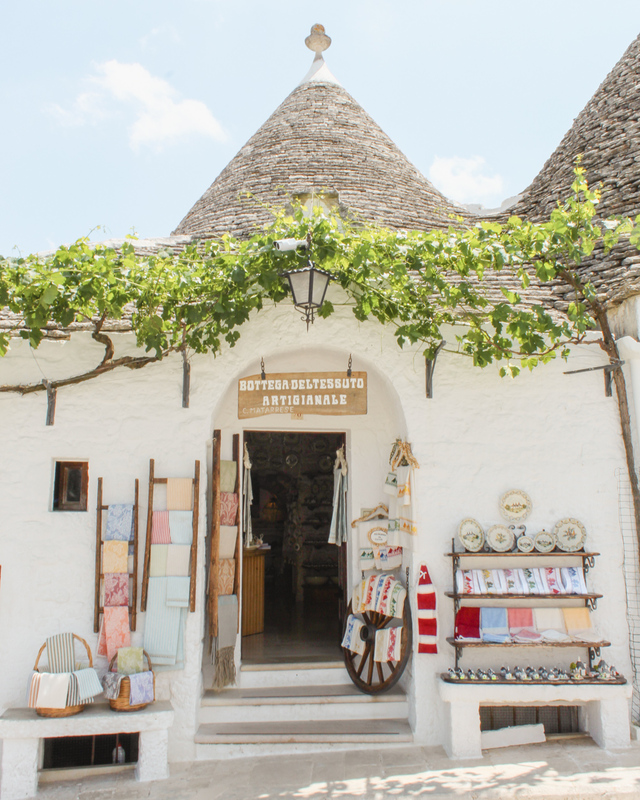 You should plan enough time to go to Trulli e Puglia Wine Bar though. It’s an underground wine bar right off the main street. Our server was helpful at making suggestions from their local wine selection. Being the cheese addict I am, we got the cheese plate paired with jam and burrata with sun dried tomatoes. Love all the white walls with spots of color! ?? Me too! 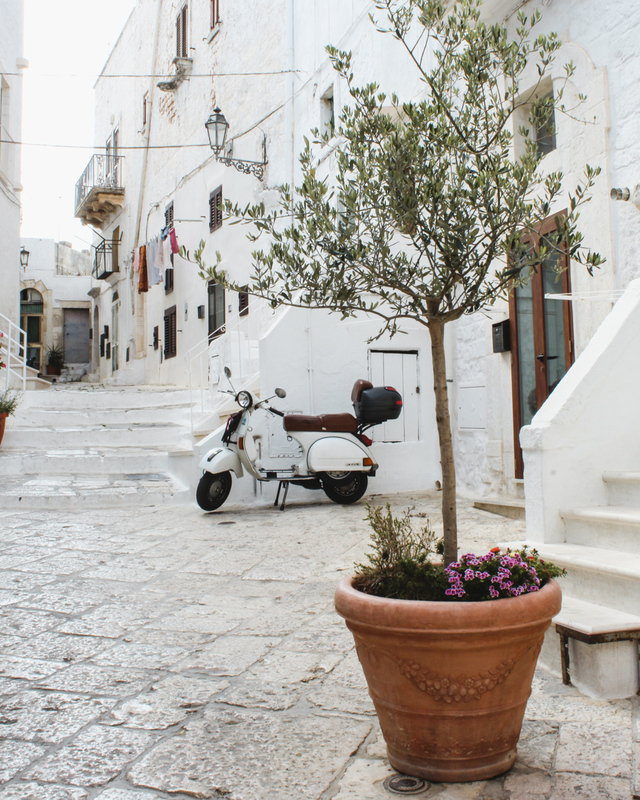 They call Ostuni La Citta Bianca (the white city) and it really is! I love all the hanging vines everywhere. Alfie looks so comfortable on the terrace! As always, such lovely photos and great content. You have me daydreaming about visiting! Hi! 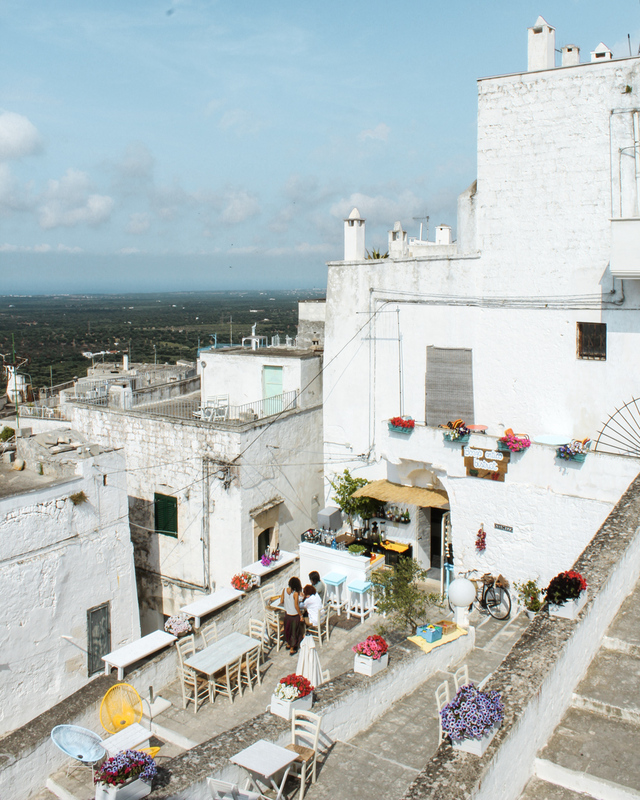 Planning a trip to Puglia and leave in a few days. You mentioned you had your all time favorite meal in Puglia but then you didn’t mention which restaurant or what you got! Please share! 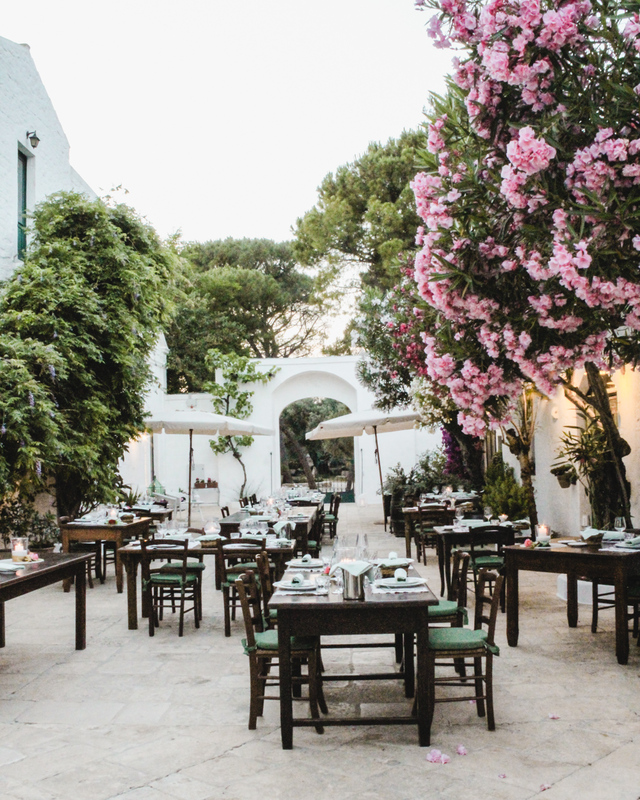 It’s the restaurant at Masseria Il Frantoio! I give all the details right before the beach photos 🙂 There’s no menu. They just make you 8 amazing courses of what is in season. 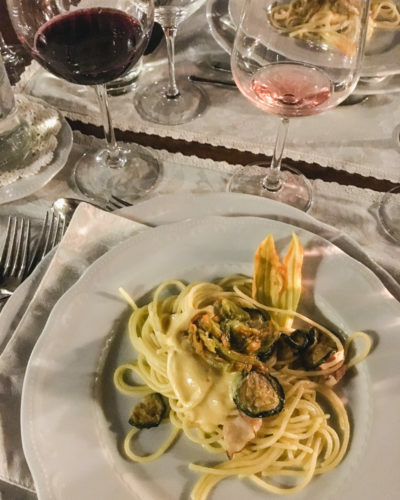 I have the photos of the pasta and fish courses posted here too. Be sure to make a reservation! Hi! 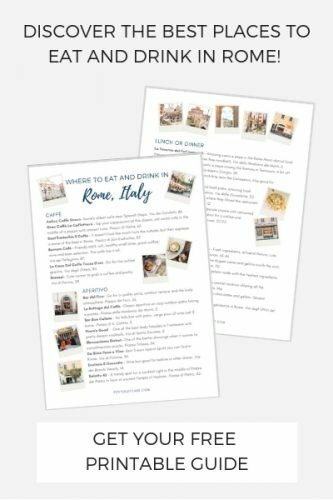 I found your post so helpful for planning our trip to Puglia! I also have Celiacs and I’m wondering if you have any advice. Did you have any issues ordering? Did most restaurants know what you were talking about when you mentioned it? Any favorite go to dishes? Ciao Marisa! Italians are incredibly knowledgeable about Celiac disease. Food is at the center of every event and they want everyone to take part. Just tell the waiter and make sure to order “senza glutine.” A lot of restaurants have gluten free pasta. 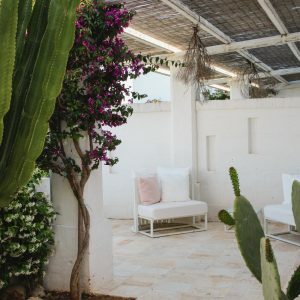 The meal I had at Masseria Il Frantoio was 100% gluten free and I would go back in a heartbeat! Thanks so much! We made a reservation at Masseria Il Frantoio, very excited about it! Hi! Looks beautiful! I am going on my honeymoon to Sicily / positano and then I have 4 nights available to go somewhere. 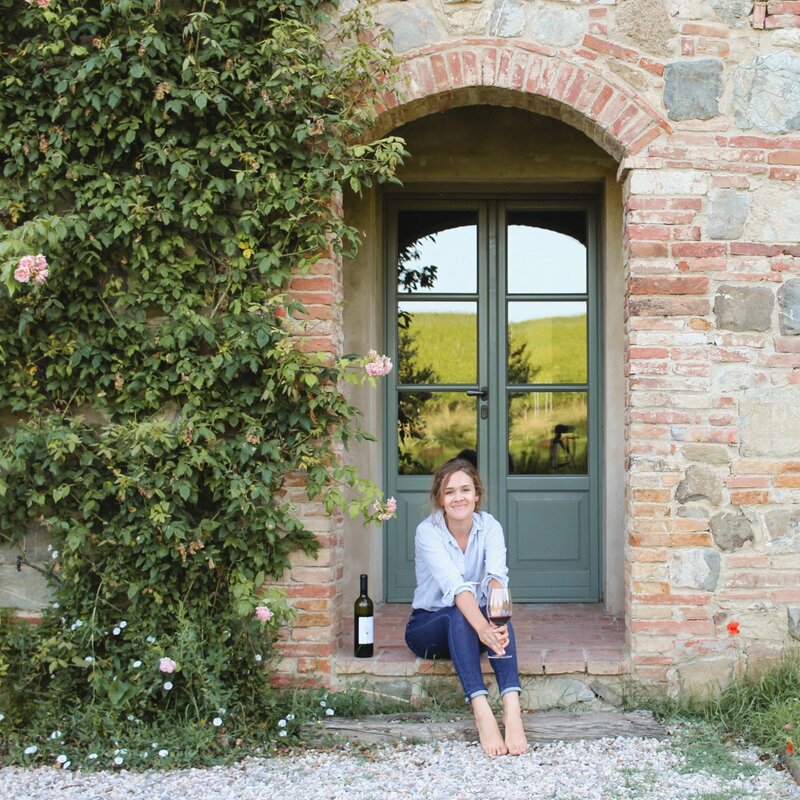 Can’t decide if I should do Puglia or Tuscany?! Do you have a preference? That is a really tough question! Both are so amazing in their own way and I could hardly choose a “preference.” It all depends on the kind of experience you want to have. 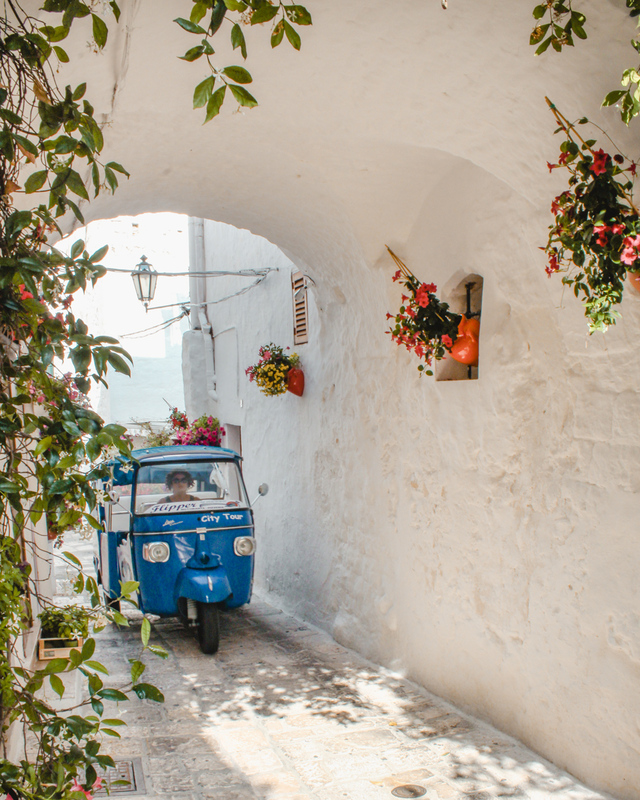 It seems like you will be getting a lot of beach time between Sicily and Positano, so you might want to do Tuscany for something non-beach related? I never made it to Sicily, so I’m jealous! Enjoy! 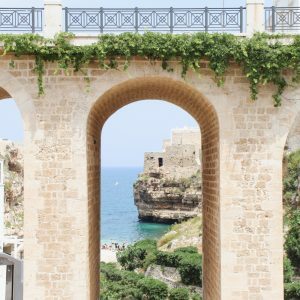 There are a lot of places not in the vacationers radar that is worth trying next time you come to Puglia…we left London and moved here permanentely! If you are coming back lets us know! 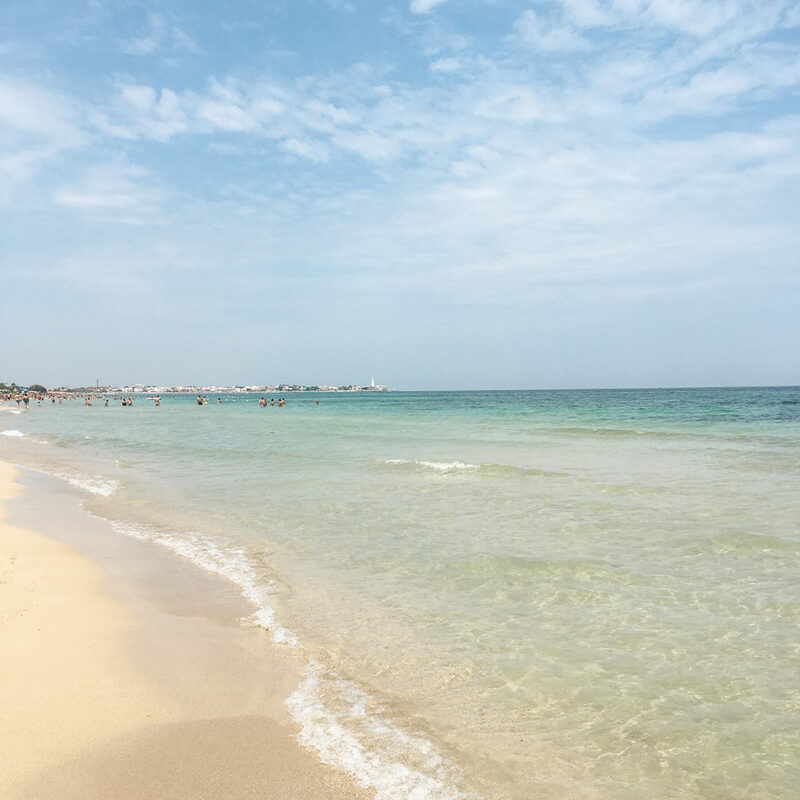 From London to Puglia… What a change! 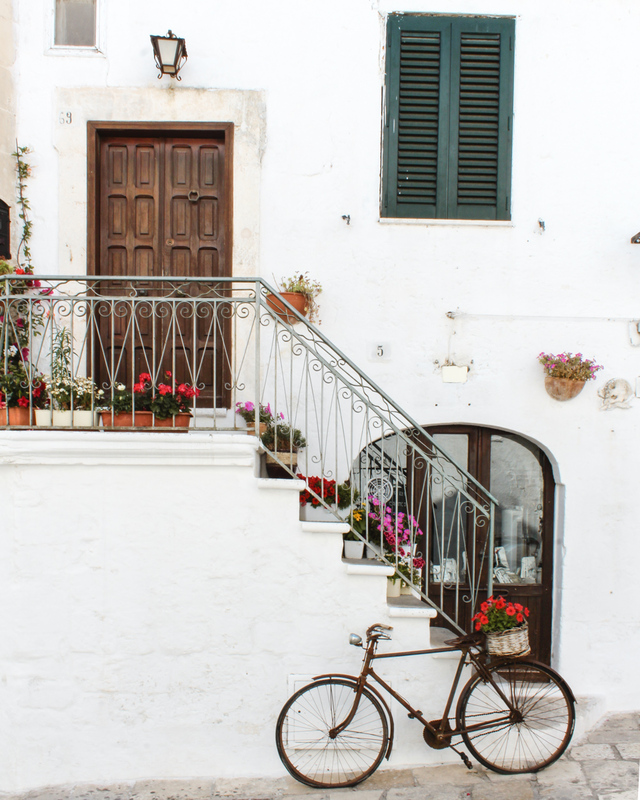 There are so many gems in Puglia. We absolutely loved it there and would be delighted to return! Thank you for this lovely guide! I am not sure if this is OK to ask here, but could I ask about the price for the set menu at Masseria il Fratoio? We just try to budget a bit around special meals/hotels so would love to have an idea, and I didn’t see it on their website. Thanks so much for your help! It was around 65 euro a person for 8 courses and wine. I’m not sure, but they might offer lunch and/or a reduced meal with 4 courses. They were responsive to email when I reached out. Be sure to contact them for the details and book in advance! We’re planning a trip to the south later in the year and will have only a week there. We’re torn between basing ourselves in Bari or Lecce. We’ll have a car. What do you think? Hi Gary, I have never been to Lecce or the tip of Puglia so I can’t really say! It all depends on what towns you want to see. 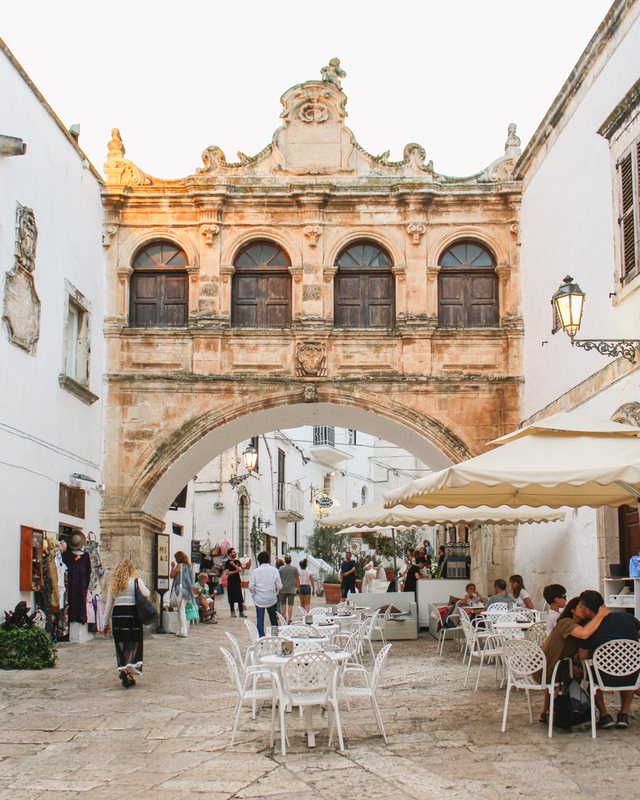 We used Ostuni as our base in Puglia. Perhaps you could do both (three nights and three nights)? Enjoy your time in Puglia!! I absolutely loved it!